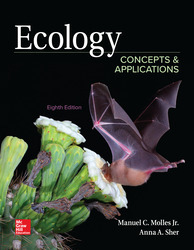 Ecology: Concepts and Applications by Molles places great emphasis on helping students grasp the main concepts of ecology while keeping the presentation more applied than theoretical. An evolutionary perspective forms the foundation of the entire discussion. The book begins with the natural history of the planet, considers portions of the whole in the middle chapters, and ends with another perspective of the entire planet in the concluding chapter.